Mabel Kendall married William Reed. Mabel Kendall was born in 1604. She died in 1690. 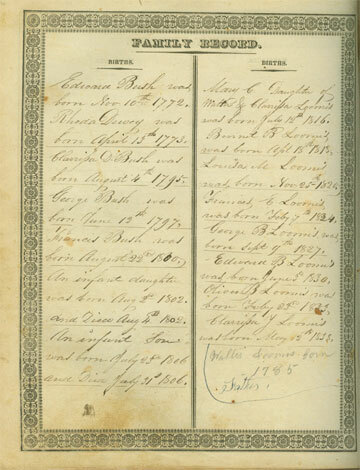 Walter Loomis was born on 8 October 1785 at Southwick, Hampden Co., MA.1 He was the son of Noah Loomis and Mary Dewey.1 Walter Loomis married Clarissa D. Bush, daughter of Edward Bush and Rhoda Dewey, on 28 December 1814.2,3 Walter Loomis died on 13 August 1866 at Southwick, Hampden Co., MA, at age 80.2 He was buried at Pine Hill Cemetery, Westfield, Hampden Co., MA. 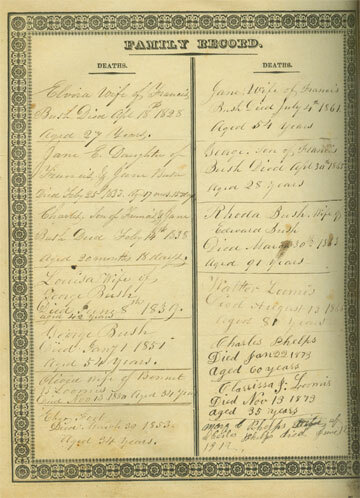 Walter and Clarissa were enumerated in the 1850 Southwick, Hampden Co., MA, federal census. He was a farmer, age 64, she was 54. Children in the household were Edward 19, Oliver 16, and Clarissa 12. Cousins Shem and Japhet were enumerated nearby. 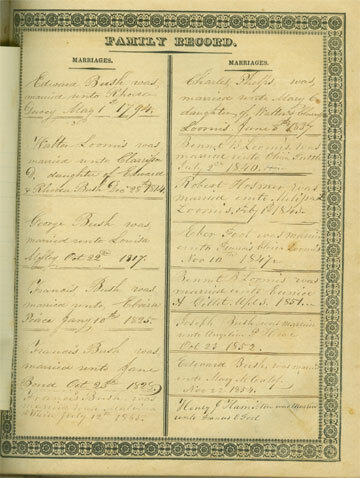 Walter and Clarissa were enumerated in the 1860 Southwick, Hampden Co., MA, federal census. He was a farmer age 74, she was 64. Children in the household were Geo. B. 32, Edward B. 30, Oliver B. 27, and Clarissa J. 22. Ulysses A. Wynn married Sarah Ann Cox. Sarah Ann Cox married Ulysses A. Wynn. Albrecht Obrist married Elizabeth Miller. Elizabeth Miller married Albrecht Obrist. 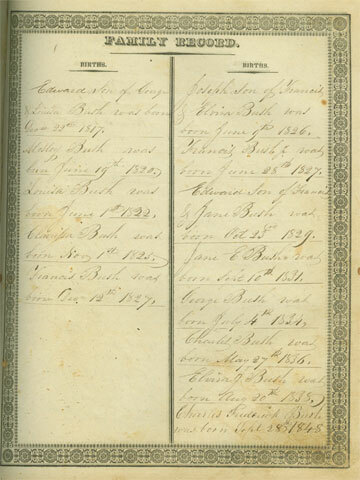 Clarissa D. Bush was born on 4 August 1795 at Westfield, Hampden Co., MA.1,2 She was the daughter of Edward Bush and Rhoda Dewey.1 Clarissa D. Bush married Walter Loomis, son of Noah Loomis and Mary Dewey, on 28 December 1814.1,2 Clarissa D. Bush died on 21 May 1891 at Westfield, Hampden Co., MA, at age 95.1,2 She was buried at Pine Hill Cemetery, Westfield, Hampden Co., MA. Zachariah Bush was born on 25 October 1742 at Westfield, Hampden Co., MA. He was the son of Zachariah Bush and Mary Loomis. Zachariah Bush married Mary Falley on 29 November 1764 at Westfield, Hampden Co., MA. Zachariah Bush died on 24 November 1811 at Houseville, Lewis Co., NY, at age 69. Zachariah Bush was born in 1719. He married Mary Loomis, daughter of Sergt. Samuel Loomis and Rebecca Noble, on 21 January 1741.1 Zachariah Bush died on 10 February 1800. Thomas H. Sheldon was born on 12 May 1818 at Providence, Providence Co., RI. He married Martha Uncles on 21 January 1844 at Franklin Co., OH. Thomas H. Sheldon died on 22 November 1854 at Franklin Co., OH, at age 36. Martha Uncles was born on 7 January 1824 at Columbus, Franklin Co., OH. She married Thomas H. Sheldon on 21 January 1844 at Franklin Co., OH. Martha Uncles died on 9 June 1912 at Columbus, Franklin Co., OH, at age 88. George E. Walker was born circa 1797 at probably Burlington, NJ. He married Marriet Mercer on 22 May 1821 at Baltimore, Baltimore Co., MD. George E. Walker died on 28 October 1864 at near Bloomington, IL. Marriet Mercer was born on 30 June 1802 at Sassafras Neck, Cecil Co., MD. She married George E. Walker on 22 May 1821 at Baltimore, Baltimore Co., MD. Marriet Mercer died on 24 October 1869 at near Bloomington, IL, at age 67. William Gault Wear was born on 11 December 1817 at Blount Co., TN. He married Sarah Amanda Yancey on 2 November 1837 at Cooper Co., MO. William Gault Wear died circa 1900 at Eureka Springs, AR. Sarah Amanda Yancey was born on 11 June 1819 at Glasgow, KY. She married William Gault Wear on 2 November 1837 at Cooper Co., MO. Sarah Amanda Yancey died on 4 December 1879 at Cooper Co., MO, at age 60. Child of Sarah Coe and John William Robinson Jr.
Lloyd Mether married Mary Carr. Lloyd Mether died. Mary Carr married Lloyd Mether. Lorrin Smith married Norma Hansen. Norma Hansen married Lorrin Smith. William Wellman married Elizabeth Spencer, daughter of William Spencer and Agnes Harris. William Wellman Jr. was born in 1661. He was the son of William Wellman and Elizabeth Spencer. William Wellman Jr. married Elizabeth (?) William Wellman Jr. died on 23 August 1736. Elizabeth (?) was born circa 1661. She married William Wellman Jr., son of William Wellman and Elizabeth Spencer. Child of Elizabeth (?) and William Wellman Jr.
Gideon Wellman was born on 8 March 1696. He was the son of William Wellman Jr. and Elizabeth (?) Gideon Wellman married Concurrence Hull on 14 April 1720. Gideon Wellman died in 1760. Concurrence Hull married Gideon Wellman, son of William Wellman Jr. and Elizabeth (? ), on 14 April 1720. Lydia Wellman was born on 8 September 1733 at Killingworth, Middlesex Co., CT. She was the daughter of Gideon Wellman and Concurrence Hull. Lydia Wellman married Silas Kelsey on 10 March 1757 at Killingworth, Middlesex Co., CT. Lydia Wellman died on 15 March 1801 at Killingworth, Middlesex Co., CT, at age 67. Silas Kelsey was born on 16 April 1733 at Killingworth, Middlesex Co., CT. He married Lydia Wellman, daughter of Gideon Wellman and Concurrence Hull, on 10 March 1757 at Killingworth, Middlesex Co., CT. Silas Kelsey died on 28 August 1802 at Killingworth, Middlesex Co., CT, at age 69. Margaret Kelsey was born on 1 August 1760 at East Guilford, New Haven Co., CT. She was the daughter of Silas Kelsey and Lydia Wellman. Margaret Kelsey married John Wilcox III on 17 June 1781 at Killingworth, Middlesex Co., CT. Margaret Kelsey died on 8 May 1804 at Killingworth, CT, at age 43. John Wilcox III was born on 15 December 1760 at East Guilford, New Haven Co., CT. He married Margaret Kelsey, daughter of Silas Kelsey and Lydia Wellman, on 17 June 1781 at Killingworth, Middlesex Co., CT. John Wilcox III was buried on 8 July 1812 at Clinton Cemetery, Clinton, Middlesex Co., CT.
Charles Wilcox was born on 3 December 1789 at Waterside (Clinton), Middlesex Co., CT. He was the son of John Wilcox III and Margaret Kelsey. Charles Wilcox married Almira Rood on 6 February 1813. Charles Wilcox died on 27 October 1827 at Detroit, Wayne Co, MI, at age 37. Almira Rood married Charles Wilcox, son of John Wilcox III and Margaret Kelsey, on 6 February 1813. Eben North Wilcox was born on 4 December 1820 at Detroit, Wayne Co, MI. He was the son of Charles Wilcox and Almira Rood. Eben North Wilcox married Mary Louise Cole. Eben North Wilcox died on 19 January 1891 at age 70. Mary Louise Cole married Eben North Wilcox, son of Charles Wilcox and Almira Rood. Henry Cole Wilcox was born on 12 March 1849 at Detroit, Wayne Co, MI. He was the son of Eben North Wilcox and Mary Louise Cole. Henry Cole Wilcox married Harriet Louise Cobb on 1 January 1874. Henry Cole Wilcox died on 16 May 1874 at age 25. Harriet Louise Cobb married Henry Cole Wilcox, son of Eben North Wilcox and Mary Louise Cole, on 1 January 1874. Daisy Cobb Wilcox was the daughter of Henry Cole Wilcox and Harriet Louise Cobb. Daisy Cobb Wilcox married Vincent Leonard Price. Vincent Leonard Price married Daisy Cobb Wilcox, daughter of Henry Cole Wilcox and Harriet Louise Cobb. Vincent Leonard Price Jr. was born on 27 May 1911 at St. Louis, St. Louis Co., MO. He was the son of Vincent Leonard Price and Daisy Cobb Wilcox. Vincent Leonard Price Jr. married Edith Barrett on 23 April 1938. Vincent Leonard Price Jr. married Coral Browne on 24 October 1974. Vincent Leonard Price Jr. died on 25 October 1993 at Los Angeles, Los Angeles Co., CA, at age 82; of lung cancer and emphysema. Vincent Leonard Price, Jr. was born on May 27, 1911 in St. Louis, Missouri. 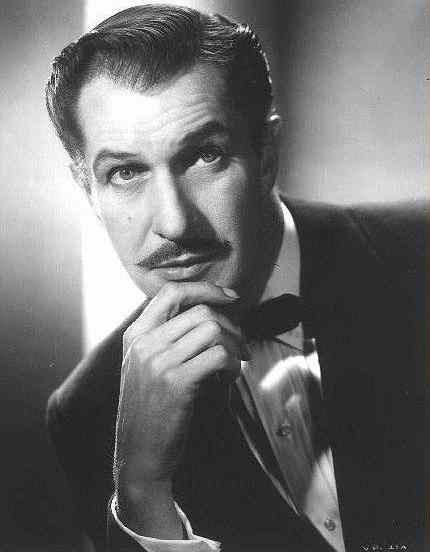 He was the son of parents Vincent Price, Sr. and Marguerite Willcox. He was the youngest of four children. His father was a wealthy candy factory executive, and Vincent was raised in an affluent home. From a young age he enjoyed cooking and art. After high school, in 1929, Vincent was sent off to Yale like his father and brother before him. He graduated in 1933, and took a job at the Riverdale School in New York, teaching and helping out with odd jobs. In 1934 he decided to go back to school, and enrolled at the Courtauld Institute of the University of London. His love of theatre had been building over the past few years, and he had participated in a few bit parts. In 1935 he took a spot in the Gate Theatre's production of "Chicago." His next play was "Victoria Regina," and he did some summer stock work as well. After "Victoria Regina" wrapped up in London, the play was going to debut in New York. Price was asked to reprise his role in the stateside performances. He agreed, and returned to the US. After "Victoria Regina's" success on Broadway, Price was offered a Hollywood contract. However, he was still new to acting and wanted to gain experience before setting off for the silver screen. He continued to do theatre work in preparation for his Hollywood debut. Meanwhile, he married actress Edith Barrett on April 23, 1938. When he felt he was ready, he went back to Hollywood and took a role in his first film, "Service De Luxe." He was touted as a heart-throb by the studio. After this success, he continued to do more theatre and film. Price's early career was not filled with campy horror films. He was an ideal, charming, funny leading man and even got press in the hunky celebrity magazines. Vincent's first child, Vincent Barrett Price, was born on August 30, 1940. Vincent was making films in a contract with 20th Century Fox. He and wife Edith split in 1944, but reconciled in 1946. Unfortunately, things were not to work out, and the couple split for good in 1947. Meanwhile, Vincent continued his film work in movies such as "Laura" and "Up In Central Park," and had also taken up doing radio shows. In 1949, Vincent remarried, this time to Eleanor Mary Grant. The two honeymooned in Peru, and then settled into their Los Angeles home. They decorated it with art and antiques because of Price's great love for art. In 1951, Vincent helped set up a collection of art for East Los Angeles College. It is still there today, in his name, and his family serve on the board of directors. Price continued his movie career, squeezing in many television appearances as well. In 1953, he made the picture that is perhaps his most famous, "House of Wax." Following that film, he did others such as "The House on Haunted Hill" and "The Fly." It was from this period that Price became known for his horror movies. In 1959, Price wrote "I Like What I Know," and auto-biography filled with lots of art appreciation content. In early 1960, he began a relationship with American International Pictures that would produce some of his best known films, such as "The Fall of the House of Usher" and "The Raven." In 1961, he was approached to join the White House Art Committee under Jackie Kennedy. He also penned another book, "The Book of Joe," inspired by his love of dogs and one of his own in particular. Price's second child, Mary Victoria, was born on April 27, 1962. Price continued to do film, and even began a partnership with Sears department stores, creating the Vincent Price Collection of art collectibles. In 1965, he and his wife published "A Treasury of Great Recipies," highlighting Price's love of food. Price continued to do film, television, and theatre throughout the 60's and 70's. In 1973, Mary Price filed for divorce. Vincent had fallen in love with another actress, Coral Browne, and the two married on October 24, 1974. Vincent's career continued, and in 1980 he began to host "Mystery!" for television (which he did for the next 10 years). In 1981, he narrated an animated short called "Vincent," by a young animator named Tim Burton. Burton was to later do a tribute to Price near the time of his death. Throughout the 1980's, Price continued to be appreciated for his work on and off the screen. He also did many ads for various products including Hangman, Citibank, and Isuzu. Sadly, he was diagnosed with Parkinson's disease. His wife Coral died on May 29, 1991 of cancer, and Vincent followed her on October 25, 1993 from Parkinson's and lung cancer. Vincent Price left quite a legacy. The Library of Congress' Manuscript Division even asked to hold Price's personal documents in their collection. He was much more than a horror actor; he was a good man, an art lover, a great cook, a writer, and a father. And he is sorely missed. Edith Barrett married Vincent Leonard Price Jr., son of Vincent Leonard Price and Daisy Cobb Wilcox, on 23 April 1938.